On the Everlasting Trusth website and radio broadcasts we have made periodic references to theological liberalism. The category theological liberal is important, but often neglected, distinction. Theological liberalism has nothing to do with American politics. Liberal politics are usually associated with the democratic party, but liberal theology is a category that refers to what someone believes about God and the Bible. Liberal theology began to gain ground in America during the late 1800’s. Soon there was conflict in the major denominations between liberal and conservative groups. Those early battles were fought over the inspiration of the Bible, the inerrancy of the Bible, the virgin birth of Jesus and the genuineness of miracles in the Bible. The liberals denied all these. The theological conservatives strongly defended them. A theological liberal elevates the authority of science and reason to be equal or greater than the authority of the Bible. In the 1800’s when reason declared miracles were not possible, the liberal agreed. When science concluded the world evolved over a long period of time, the liberal began to explain Genesis in ways that accommodated millions of years of evolution. The meaning of Scripture is shaped for the liberal by science, experience, modern philosophy, psychiatry and contemporary morals. Sometimes the liberal theologian denies outright the truth of the Bible, but often he is more subtle. Many liberal theologians reinterpret a passage by manipulating the historical context. For example, since Paul was writing into a culture that did not value women’s rights, therefore his statements about a wife’s role in marriage have to be understood through the cultural grid of Paul’s day. The liberal theologian believes that if Paul were writing today he would agree with the progressive view of gender roles. Liberal theology is frequently shaped by a single ethical ideal that is elevated over the rest of Scripture. This ethic becomes the interpretative grid through which everything else in the Bible is understood. For example, in liberal theology the truth that God is love reinterprets the Biblical commands regarding marriage and sexual purity. A loving God would never condemn loving relationships, no matter who were involved. Modern ethical concerns seem to dominate the focus of liberal churches. Usually the ethical standards of theological liberalism are closely aligned with the ideals of political liberalism. The liberal theologian is often concerned with promoting racial justice, economic equality, environmentalism, access to abortion and acceptance of homosexuality. These ethical concerns outweigh doctrinal concerns. Dealing with social injustice is far more important than preaching the Biblical truths of Jesus and salvation. The great danger of liberalism is its denial of the authority of the Bible. By denying the truth of Scripture, the liberal effectively denies the gospel. Those who deny that Jesus is God, that Jesus was a perfect man and that Jesus rose from the dead deny key truths that must be believed to be saved. A message that ignores these core truths of the gospel is not a Christian message. Theological liberalism is not just a different viewpoint about certain difficult or minor doctrines. Theological liberalism rejects historic Christian doctrine and it rejects Biblical doctrine. Though it claims the name of Christian, theological liberalism is not Christian. 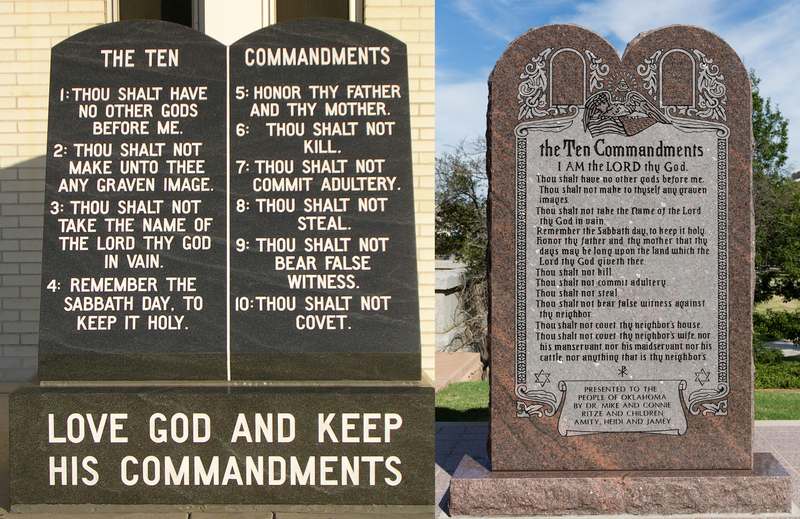 Why are there two different versions of the Ten Commandments? Most Americans are familiar with the Ten Commandments. Even those who have little religious background know the Ten Commandments are a list of rules given by God. The ten commandments can be found in Exodus 20:1-17 and Deuteronomy 5:6-21. They are divided into two groups, the first group contains the commands relating towards God and the second group the commands regarding others. Yet, the lists of ten commandments found in the Catholic catechism are different from that taught in most Protestant churches. Protestants typically divide the ten commandments into four commands about God and six about others. The first four are “Thou shalt have no other gods before me.” “Thou shalt not make unto thee any graven image.” “Thou shalt not take the name of the Lord thy God in vain.” and “Remember the Sabbath day to keep it holy.” The second table of the law begins with “Honor thy father and mother” and ends with the, “Thou shalt not covet.” Unlike Lutherans and Catholics, the Protestants view the commands against covetousness as one. Does this difference matter? Not a whole lot. Protestants, Catholics and Lutherans agree with one another on the content of the ten commandments, just not the division of them. Catholics consider the prohibition against graven images to be part of the first commandment and Protestants view all the commands against covetousness as one. These differences are trivial. What does it mean to “evangelize”? Evangelism is an important part of Christianity. A large portion of Christianity is known as “evangelical.” Some preachers are called “evangelists.” Many Christians have been told it is important for them to “evangelize.” What does this mean? To evangelize is to tell someone good news. A messenger that brought a report of victory in battle brought the evangelion, the “good news.” In the Greek world, an evangelion was a message from the gods. In the Roman world the announcement of the birth of an emperor was good news. Any good news was an evangelion. To evangelize is to tell the evangalion. The good news was prophesied in Isaiah 61:1-2, “The Spirit of the Lord GOD is upon me; because the LORD hath anointed me to preach good tidings unto the meek; he hath sent me to bind up the brokenhearted, to proclaim liberty to the captives, and the opening of the prison to them that are bound; To proclaim the acceptable year of the LORD, and the day of vengeance of our God; to comfort all that mourn;” Jesus quoted Isaiah 61 in His hometown of Nazareth to announce that He was the prophesied Messiah.